"The Dornenstein Estate is simply one of the best-scripted maps we've seen so far. While taking a short, spooky journey through this mansion, you'll need to find several relics to progress. Tricks abound throughout the house as sights, sounds, and freaky experiences make you wonder what is real and what's not." Enter your Realm's settings menu. 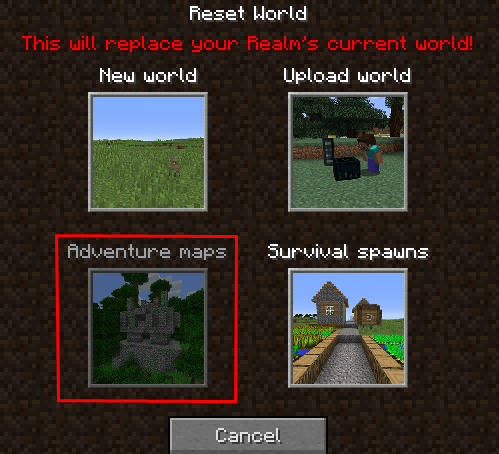 Select an unused world slot and click "Reset world"
Search for "The Dornenstein Estate", select it and connect to your Realm! Fixed player not spawning properly in some occasions. Added "activate particles!" hint in lobby. Preventing player from placing the skull on the sides of its block in the lobby. Forced skull loading to prevent steve skulls for first animation frame. Items can no longer be lost due to fire or lava room sequence. Added warning when loading the map in peaceful difficulty. Added warning when multiple players are in adventure mode. Removed command block tower to not be visible from the buildings north windows. +1 SuperDuggy117 I want to play this map really badly, but I HATE jumpscares. I'm not sure what to do. I might play anyways, though. 0 kaylaminecraft2 Hey This Map Looks Awesome And I'm Going To Do A Video On It Soon But I Have One Question.. Does This Map Have Jumpscares? +5 Rackals Who would of thought I'd ever find Minecraft scary? +8 Oz realy good map I'm very enjoy atmosphere. +2 MattPlaysROBLOX Um when i try restarting the level with the map, nothing happens. If you start the map the first player will automaticly be put into adventure mode while all other players will be spectators. You can change modes manually, however this will trigger a warning that will stay for 30 seconds. We do not recommend changing gamemodes or using commands in general since this *will* break most of our scripted events. +4 hi is it multiplayer compatible? I really enjoyed this map. The gameplay reminded me a lot of old school Resident Evil. SPOILERS??? : One possible bug that I encountered while playing was that I got stuck in the dungeon room after the gate closes behind you. Not sure if that is one of the endings and it just never tells you, or if there is supposed to be a way out of that. I looked for quite a while and couldn't find anything. Other than that, great map! Very creative!!! We're glad you enjoyed the map! If you look closely there is a hole in the wall with a button in the other cell. +2 JPal I really enjoyed this map. The gameplay reminded me a lot of old school Resident Evil. SPOILERS??? : One possible bug that I encountered while playing was that I got stuck in the dungeon room after the gate closes behind you. Not sure if that is one of the endings and it just never tells you, or if there is supposed to be a way out of that. I looked for quite a while and couldn't find anything. Other than that, great map! Very creative!!! +4 KrakenProCity OMG NİCE HORROR MAP!!!! IM SCAREDDDD DONT BED IM OMG!! +9 Frippery This was a pretty interesting map! Here's my review of it. WARNING: Contains spoilers. - The animations, particle effects, and floating text looked extremely professional and added so much to the map. - All of the relics were very cleverly hidden, especially the one where you had to make the spider break through the window. Looking for and finding the relics was very engaging. - The invincible mobs and the player's inability to fight made the mob encounters somewhat tense. - The builds were detailed and very aesthetically pleasing. - For me, the map was not scary at all. This was mainly because of a lack of story and context, the absence of a high-detail resource pack, and cliche and unthreatening scares. - There was very little story. I had no idea who I was, why I was at this house, who the family was, or what exactly they were doing with alternate dimensions. - The ending of the map was extremely disappointing. While the animations and effects looked insanely good, no information was given on what happened in the alternate dimension, and I was simply teleported to an ending room. I felt like I had done basically nothing. +3 Myst Xtreme This was a well made map! I got a little spooked, but I enjoyed the relic hunt with the various obstacles. I did a Let's Play on this map. +8 hoemknoebi Wher is the Redstone and the golden relict? +5 Slyfox Lol the game has 666 votes. What a coincidence for a horror game. This map is intended for singleplayer only and some functions will break when you have more than 1 player in adventure mode. However a player in spectator mode is fine. The false spawning is a minecraft bug that happens sometimes. +5 Vallo This map is really good! Built very well and with a perfect ending! 5 STAR! +5 l3v1l33 just played this. it was short but it was really good. i have never played an adventure map before untill this one and now im going to play a lot more. i did get scared a couple times. amazing map. i would like to see more from you guys.